The puppy class starting on April 30 is now full. Please let us know if you would like to be on the waiting list. This is a unique combination of puppy socialization and training. In this class, puppies will be gently exposed to different people, other dogs and items they will encounter in their daily life in a safe environment under the watchful eye of a professional trainer. Each week you will also learn how to teach your puppy a new obedience behavior using rewards based, positive methods. At the end of each class puppies can explore age appropriate agility equipment to increase their confidence and physical ability, or play with each other to gain social skills. We will also discuss common puppy training issues such as barking, nipping and house training. The puppies will learn to accept handling from both family members and strangers so they will later be relaxed when restrained and examined at the vet's office, handled by the groomer or petted by a child. Your puppy will learn "sit", "down", "touch", "come" and "drop it". You will also learn how to teach your puppy good pet manners, such as sitting to greet instead of jumping up and walking on a loose leash. Your puppy will get used to a variety of items in the safe class environment so he can be comfortable with distractions such as people carrying umbrellas and kids on bikes as an adult dog. Age: Puppies between 2 and 4.5 months old at the start of class. Requirements: All puppies must have at least two DHPP vaccinations (proof of immunization required). What would you like your puppy to learn? Thank you! We look forward to meeting you and your puppy in class! This new class offers continued learning, fun games and tricks for puppy class graduates. We will cover all the new skills taught in the regular beginner's class, including "Stand","Leave It", "Wait" and "Go to Your Mat". Since all the puppies will already be familiar with the basics, we will have time to add new topics and behaviors to the agenda. Behavior issues typically starting in adolescence will be discussed. Learning games and fun dog tricks will also be included. We will practice loose leash walking and "Come" with "Touch" around distractions. The "Stay" will be covered more formally now that the puppies have been introduced to the concept in the puppy class. Requirements: All puppies must have had at least two DHPP vaccinations and a rabies vaccination (proof of immunization required). All puppies must have completed the STAR puppy class or a similar puppy class. Some puppies who have not attended a puppy class may also have the appropriate foundation obedience and social skills as a result of training and socialization done at home by an experienced handler. In this class, we will focus on pet manners as well as foundation obedience skills. Your dog will learn "Sit," "Down,"Stand","Stay," "Come," "Drop It" and "Leave it." Your dog will learn to greet people politely instead of jumping up. We will also cover walking on a loose leash and waiting on cue. The "Touch" hand targeting and "Go to your mat" cues are also covered in the Good Dog Class. Any special problems or concerns? What would you like your dog to learn? Thank you! We look forward to meeting you and your dog in class! The intermediate class starting on April 30 is now full. Please contact us if you would like to be on the waiting list. Do you want to take your dog camping and hiking? Would you like to enjoy a relaxing lunch at a dog-friendly café? Get your dog ready for off leash control with the Better Dog Class. We will work on strengthening skills gained in the Good Dog Class so your dog learns to reliably respond to cues around distractions. The Better Dog Class agenda includes practicing the exercises from the American Kennel Club’s Canine Good Citizen test. You will also learn a very useful way to teach your dog to ignore things he gets excited or anxious around. These self-control exercises will teach your dog to focus on you and remain calmer around distractions. Requirements: Dogs must have completed the Good Dog Class, or a similar basic training class. All dogs must be current on DHPP and rabies vaccinations (proof of immunization required). This advanced class prepares teams for the American Kennel Club’s Community Canine title, also known as the Advanced Canine Good Citizen (CGCA) test. The exercises are designed to show that the dog remains calm and responds to the handler’s cues around distractions in a community setting. This class also introduces handlers to exercises from the AKC’s Rally Novice program. Rally encourages communication between the handler and dog and can be a natural link between the CGC program and more formal obedience or agility competition. Rally is fun for people and dogs and a good way to enjoy teamwork with your pet in a relaxing and supportive environment. Even if you do not want to compete and get your dog titled in rally, the skills learned in this class are useful for pets. Requirements: Dogs must have completed the Better Dog Class, or a similar intermediate training class. All dogs must be current on DHPP and rabies vaccinations (proof of immunization required). Any special goals or concerns? The goal of the training at The Canine Coach is clear communication between the person and the dog. The AKC Rally rules allow unlimited communication between the person and his or her canine partner. The handler may use both physical and verbal cues and praise the dog. In the novice level of rally, all exercises are performed on leash. This sport is an excellent way to strengthen the bond with your dog. With practice, person and dog become better at communicating with each other and moving together as a team. This class offers teams the chance to run through complete AKC Rally Novice courses. This is important for those teams getting ready for Rally trials, but also fun for people who just want to try the sport with their dog. The small class size allows for every dog to run each course, as well as practice the more challenging skills separately. The class will be a friendly and safe environment to enjoy spending time with our dogs, support and encourage each other, make new friends, and laugh and learn together. 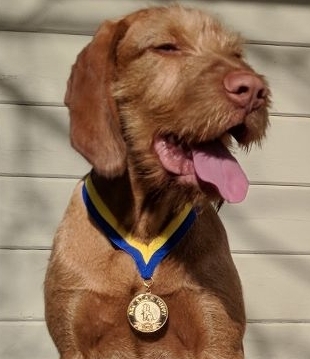 Requirements: Dogs must have competed the Community Canine and Introduction to Rally Class, or completed similar training elsewhere, and earned the CGCA title. Disclaimer: Dogs will not be interacting with each other in the basic training, intermediate or advanced training classes. While we do our best to keep the distance between dogs at a maximum and the distractions to all dogs at a minimum, group classes can be a stressful environment for some dogs. Group classes are not an appropriate training venue for dogs that are very uncomfortable with or reactive towards other dogs. Some dogs may be able to join a group class after they and their handler have gained some additional skills with private training. If you have questions about your specific dog and the best training environment for him, please contact us. ©2018 The Canine coach LLC. All rights reserved. SITE BY STUDIO NUÑEZ | POWERED BY SQUARESPACE.